Kevin Lockett always said he did not want to coach. He just wanted to watch his kid play like any other parent does. Eventually, when Tyler was about 14 years old, he asked his dad for more participation in his development as a football player, and Kevin obliged. Even in a one-on-one coaching capacity, though, the instincts of a father and a coach are different and sometimes make for a tricky combination. Apparently Kevin found that balance and Tyler received the instruction well, because just a few short years later, and the son of Kansas State’s all-time leading receiver is getting game time at wide receiver as a freshman and riding a two-game streak of kick returns for touchdowns. What seems so funny in retrospect is that when the Locketts first began the process of signing Tyler up at Kansas State, they thought he would not see the field in his first season. The Locketts trusted Snyder, who has been in the business for close to half a century. The decision to play Tyler as a freshman is just one more example of why Bill Snyder is again a candidate for Coach of the Year. While Tyler has plenty of feedback from the Kansas State coaches now, he still talks to his dad on a regular basis. When he listens to his son’s report from each day’s practice, Kevin again strives to find the balance between coach and father. Tyler’s equally renowned uncle, Aaron, who is second all-time at Kansas State in punt return yardage and fourth all-time in receiving yards, walks the same thin line when it comes to advice. He has talked to his nephew about how the ball flies, how a returner should position himself, ball security and similar aspects, but he feels like many of the essentials cannot be taught. In addition to the benefit of having acquired football knowledge from his father and uncle over his whole life, Tyler has also been blessed with a combination of their physiques. “I think he’s built like me,” Kevin said. “I think he’s a little bit ahead of me in regards to where I was physically in terms of size and stature at his age, but I think he has route running ability, his knowledge of the game, always understanding what defense are trying to do to him, and I think the way he catches the ball, he does a really good job of catching the ball with his hands. Overall, Kansas State’s win over Miami put the Wildcats in a great spot going into the Big 12 portion of the season. In such a good game, there were some even better moments. Here are the ones I found particularly compelling. Tyler Lockett’s first touchdown – The wide receiver (and son of the Wildcats’ all-time leading receiver Kevin Lockett) had a rough outing last week, but on Saturday he came up big for the Wildcats, putting himself on the receiving end of a 20-yard zinger from quarterback Collin Klein for the team’s first passing touchdown of the game. 4-of-4 in the red zone – Kansas State finished well. When they got within striking distance, the Wildcats struck. The efficiency with which the team trampled over the Miami defense and converted on those drives seems to be a very positive sign for the team. Delay of game due to weather – Since I was unable to see the game live in Miami, I really enjoyed the irony that the “Sunshine State” was rainy and dreary while Kansas had beautiful, clear, perfect weather. Kevin Lockett, Kansas State’s all-time leading receiver who went on to play seven years in the NFL, was not surprised that his son, Tyler, decided to play football for the Wildcats. What he did not expect was that the coaching staff would be strikingly similar to what it was when he played there from 1993-1996. Despite the must-win mentality of big-time college football, Snyder took the time, Lockett said, to help him mature as a young man and prepare him for life after football. Accordingly, the focus was not only on what happened on the field, but off-the-field behavior as well. 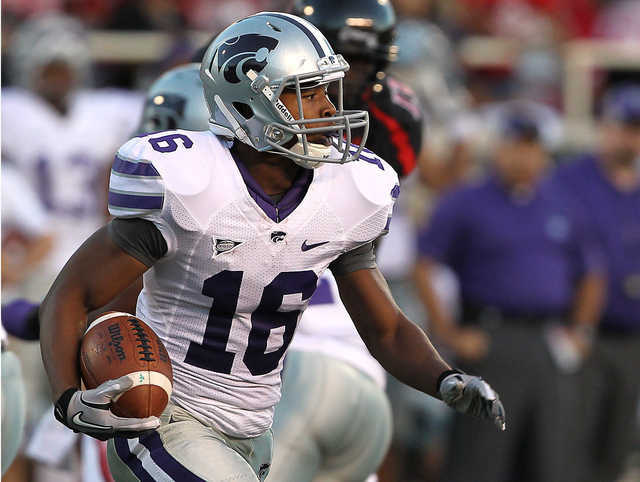 Aaron Lockett, one of the best kick returners in school history and the brother of Kevin, characterized Snyder as a “standup guy” who taught players to be accountable and productive and gave them a chance to be successful. 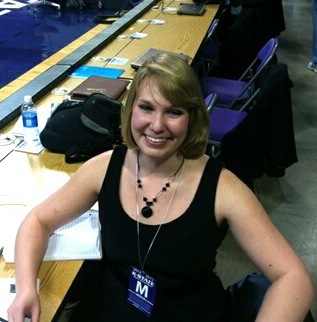 To all long-time Kansas State fans, this freshman’s last name is a familiar one. His dad, Kevin, is K-State’s all-time leading receiver, and his uncle, Aaron, is No. 4 on that list. However, Tyler has impressed people in practice all by himself and earned as a No. 2 on the depth chart behind senior Sheldon Smith. 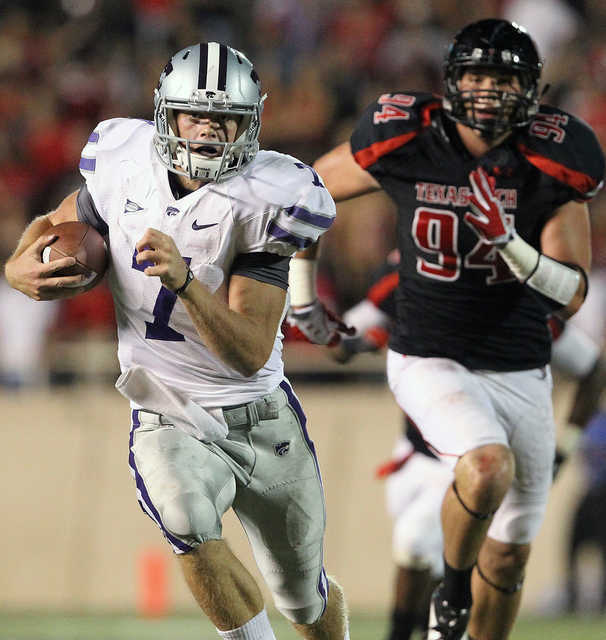 Quarterback Collin Klein said he had hardly seen Kevin and Aaron play before coming to Kansas State, but from what he did see, and what he has seen from Tyler so far, he draws a positive parallel. Senior and two-time captain Emmanuel Lamur mentioned that Lockett is one of the offensive players who has stood out to him in practice. With the depth at the receiver position – Brodrick Smith, Tramaine Thompson, Chris Harper, Sheldon Smith, etc., surely it is a good sign that other players are taking notice of this freshman. Head coach Bill Snyder, who usually likes for players to redshirt their first year, said Lockett may be seeing the field some this season.